Despite taking a beating on UFC Undisputed 2010, THQ has signed a deal locking down the rights to the UFC videogame license until 2018. Back in August, THQ marketing chief Jon Rooke said that in spite of the disappointing sales of UFC Undisputed 2010, the publisher remained committed to the brand. The problem, he said, wasn't the game or the franchise but the weak economy and bad timing: Rockstar's huge hit Red Dead Redemption came out just one week ahead of UFC 2010. "We're absolutely not walking away from the brand," he asserted, and while his remarks had a ring of bravado, it turns out that he wasn't just talking through his hat. THQ announced today that it has extended its licensing agreement with the UFC through 2018. "We're very excited to extend our relationship with Zuffa and the Ultimate Fighting Championship," said THQ Executive Vice President Danny Bilson. Along with conventional console releases, he said the company plans to broaden the franchise to include "social, mobile and brand extensions." The deal gives THQ the right to make Ultimate Fighting Championship videogames for all current and next-gen consoles, PCs and handhelds, along with "certain social media and wireless rights," including the iPhone and iPad. But 2018 is a long way off and getting there depends on THQ's ability to turn the property into a viable money-maker. UFC 2009 was a pleasant surprise but the 2010 edition didn't perform to the same level, selling below expectations and contributing to a $60 million reduction in THQ's annual net sales forecast. Compounding that problem is EA Sports MMA, released today, which doesn't have the UFC license but does have the might of the EA Sports machine behind it. 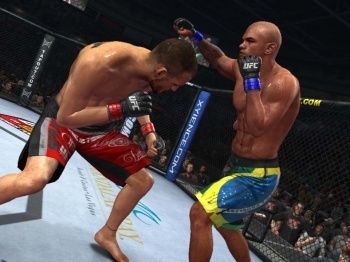 THQ has locked down the UFC, but whether it can do the same with the MMA videogame genre is a whole different question.